Graffiti is the words, colors and shapes drawn or painted on buildings, overpasses, fences and other surfaces without permission. The purpose of graffiti varies, but in most cases it is simple vandalism. Graffiti removal is a tricky business! Did you know that if graffiti is incorrectly removed, then you might have ongoing issues with hard water deposits and premature brick crumbling? When graffiti is sprayed onto your masonry walls like brick, concrete, granite etc. it penetrates and seeps deep into the surface. The more sensitive the surface, the faster the graffiti will penetrate. Therefore, the quicker it is removed, the better. Every Graffiti removal job is different. The process of graffiti removal services usually use chemical graffiti removers, high-pressure power washing, abrasion and high heat. Sometimes it takes a highly-skilled and experienced expert to draw it out with the right technology without degrading the original surface. That is why All Star Cleaning, offers a fast and efficient graffiti removal service. 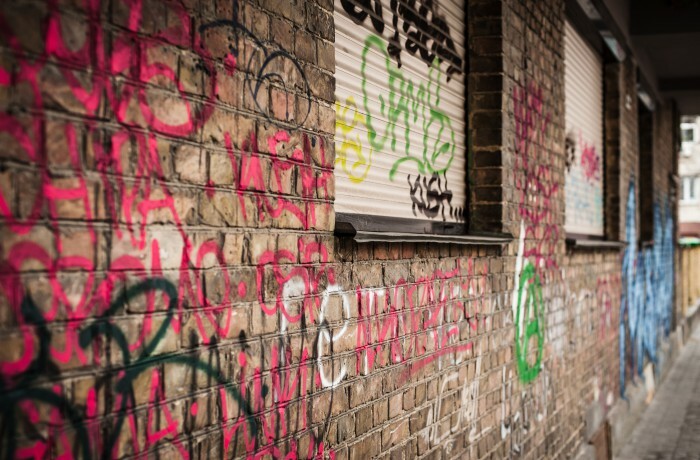 Our Graffiti removal services will safely remove graffiti without damaging the surface or leaving any residue behind. We've been doing it for many years with amazing success. Graffiti vandalism is a community problem that can lower property values and contributes to reduced retail sales. It also encourages more vandalism and other types of crime. If your building(s) is being targeted frequently, we would recommend you to get in touch with us. All Star Cleaning uses an anti-graffiti-coating that protects against paint based graffiti, fly-posting and marker pen 'tagging’. This coating is applied using a rag, brush or roller and is invisible when it dries. The product allows us to remove graffiti without the use of chemicals or abrasives, after which we simply reapply the coating to the affected area. This process is non-destructive, environmentally friendly and inexpensive. This gentle non-destructive approach is ideal for all high value surfaces. It is an inexpensive way of keeping your building exterior protected. This is some really good information about graffiti removal. It is good to know that this is a difficult thing to do correctly. I wouldn't even know where to start when it comes to removing graffiti. It does seem like a good idea to have a professional do it for you. I didn't realize that removing graffiti incorrectly could result in issues with hard water deposits and brick crumbling. There are some places in my neighborhood with graffiti that I'd like to have removed, but now I realize that I should probably get a professional to do that so it keeps the buildings in good shape. I wonder if a professional would know how to get the graffiti off of different surfaces and not just brick.